Our state of the art Computer Numerical Control machinery allows us to etch and cut the steel with pinpoint precision. We use Electrolysis to fill the etched surface with colour. 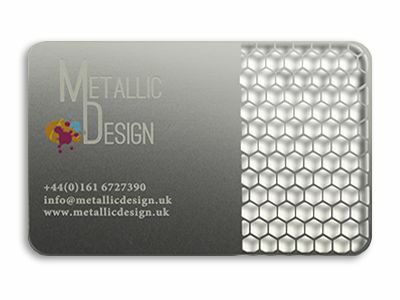 Our metal business cards have the added benefit of really customising your business cards. They are available in thicknesses of 0.3, 0.5, 0.8 & 1mm. The cards are created from tempered stainless steel cores. Our engineering capabilities allow us to cut through the steel with superior precision and to etch the metal surface with any required fonts and graphics. We can alter the shape of the cards perimeter should you require this. Etched text contrasts with the unetched fine steel surface ensures a crisp clear finish. Our cards are made from premium level stainless steel. As a result, the grained surface is always smooth and consistent. The card has memory, allowing it to fall back to shape when bent. Due to its material everyday use will not cause it to tarnish or fade over time. Our standard card size is 85mm x 54mm with rounded corners. We can cut shapes through the card such as your logo and change the shape of it by cutting away metal from the perimeter. As long as the desired shape fits within the dimensions of a standard card we will not charge anything additional. We use our state of the art CNC – Computer Numerical Control machinery to manufacture Grade I cards, this allows us to etch and cut the steel with pinpoint precision. We can add patterns, perforations and grilles. Unlike our Grade II cards we do not print onto the surface of the metal, we etch the text direct onto the surface and then fill with colour. Mirror – You will be able to see your own reflection! We are able to ‘polish’ the cards to such an extent that it will act as a mirror. Adding this as an addition to plating creates a phenomenal card. Brushed – If you are looking for a sleek and streaky ‘textured’ finish this is the one. All cards will have a thin matt layer to deflect reflections. Frosted – An uneven frosty finish. Always looks great when you are looking to interest people in not just the look of your card but the feel too. We have the ability with our Grade I cards to go that little further with customisation. We are able to provide the following extras to your card so that it can be used as so much more than just a business card.